Why in the world would you want anything other than the Mac’s built in Calendar? It does a pretty great job, right? Hold on. Fantastical can shake your world up. At least that’s what Flexibits says they can do with Fantastical 2 for the Mac. Let’s start with the killer feature: Natural Language. Just type what you’re doing tomorrow at noon as you would say it to your best friend and Fantastical will arrange all of the rest for you. No more clicking around into different boxes and worrying around if you’re creating things in the right boxes. I know this might sound like something that really is not that important of a feature, but it’s one of those things that you’ll wonder how you lived without for this long. The Views— they’ve figured out how to get all of the right views on one screen. A full 30 day calendar, a list of your events that are upcoming over the days, and your choice of day, week, or month view just like iCal. Somehow it all works in one screen in a way even Apple’s own calendar app does not. If the defult layout isn’t what you want, don’t worry, because everything is completely customizable to the way that you want to see it laid out. The second really killer feature is the calendar sets. What really make them great is the ability to set them based on current location. You can set one group of calendars to be active while you’re at work and aother set when you’re at home. Maybe at the coffee shop you want to only show another set. This is such an awesome underrated small feature that is hugely usefull. I have no use for my Facebook events, nor do I want to see when my obscure friend’s birthday is, while at the office. However, that might be nice once I leave the office and get home for the evening. Yet another one of those features that I don’t know how I live without anymore. All in all Fantastical is the best default calendar replacement. I don’t see it as something that is going to replace Outlook for my use in the corporate environment because of Microsoft’s foothold there but it’s not trying to be that. It is really a much more powerful version of the built in option that is included with the Mac. 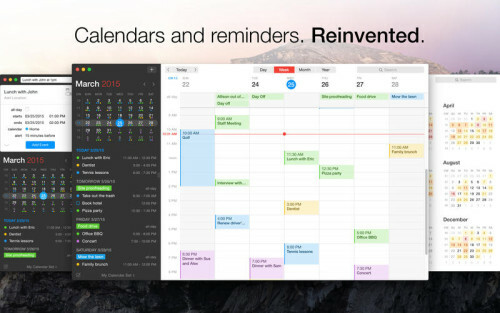 If you find yourself in the calendar app a lot and find features lacking, then look no further than Fantastical. Nice review Nick. I.need to check.thiz.out. Thanks. So what didn’t you like? You gave it 8/10, so can I assume there are a few things that you wish were improved?